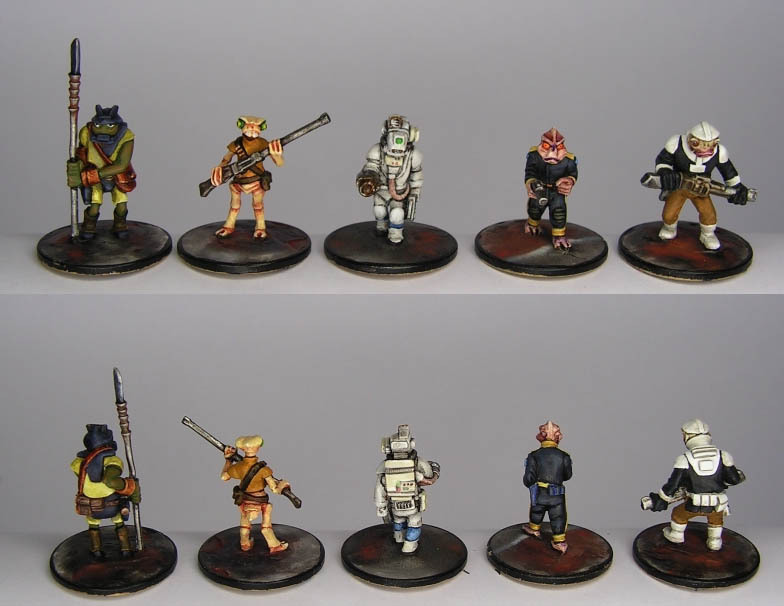 This is all the various 15mm science fiction troops (including man-size bugs and robots) we produce. 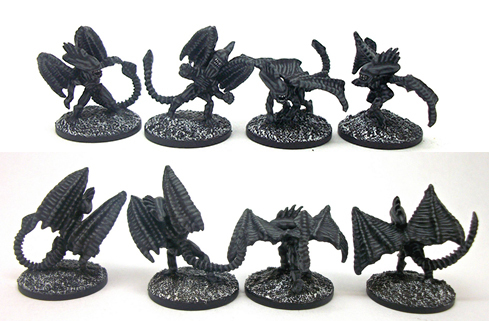 Whilst designed as 15mm, some of them (particularly buggy types) are "scaleless" and can be used in 28mm or other scales. 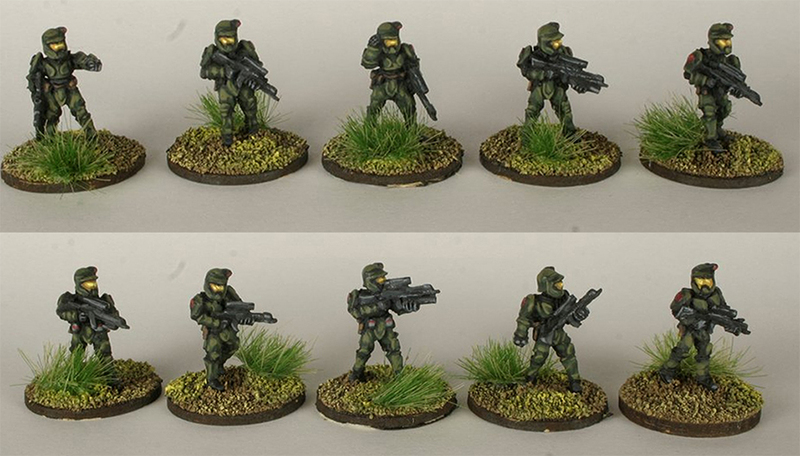 These are the same troops as listed on our various in-universe pages, but accumulated on one page without the background "fluff" as some gamers prefer to browse products that way. 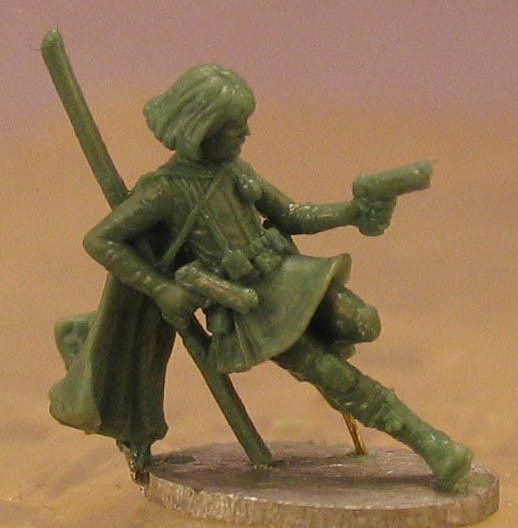 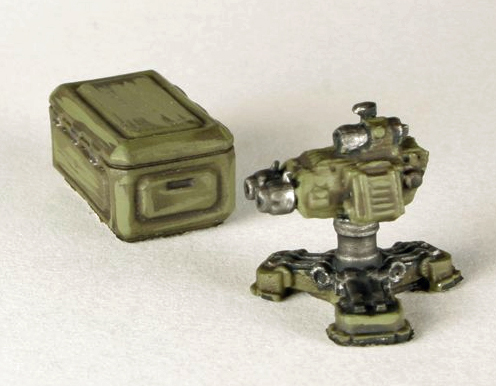 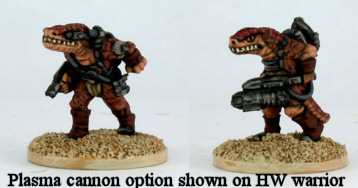 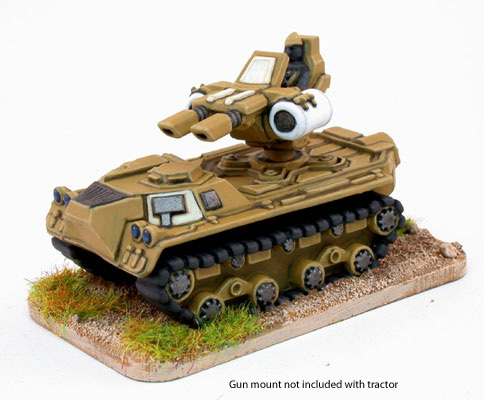 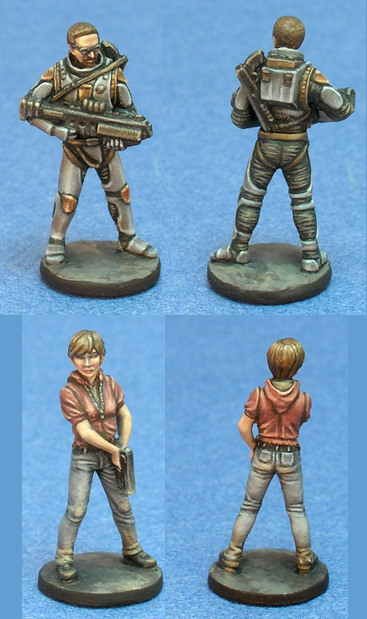 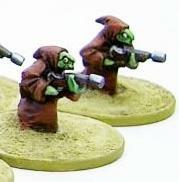 The generic listing of 15mm Sci Fi vehicles may be seen HERE. 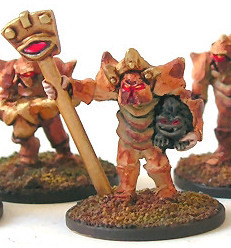 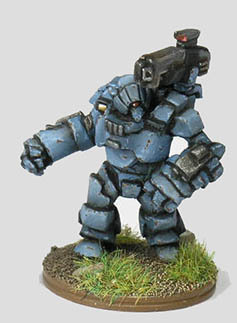 The ultimate human warriors, encased in huge, heavily armoured battle armour almost four meters tall (35mm on the tabletop), armed with a variety of weapons powerful enough to singlehandedly eliminate entire 21st century armies. 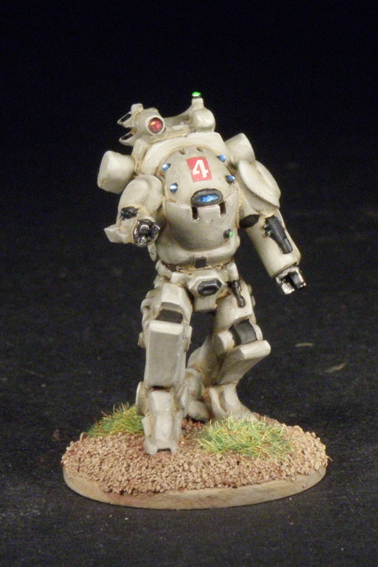 With jet and rocket movement assistance these immensely heavy suits can travel further and faster than most 21st century land vehicles. 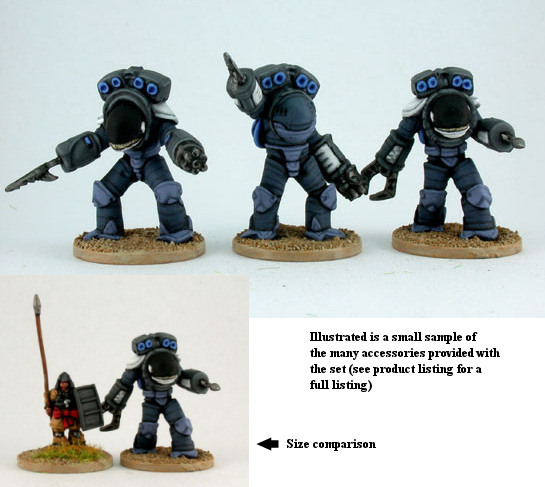 Note each of the four poses comes with all the pieces necessary to recreate one main battle suit (basic backpack, plasma flamer or missilelauncher in hand, other weapon mounted on backpack), or one forward observer suit (sensor backpack without weapons mounts, no weapon in arms) or command suit (sensor backpack with weapons mounts, plasma flamer or missilelauncher in hand, other weapon mounted on backpack). 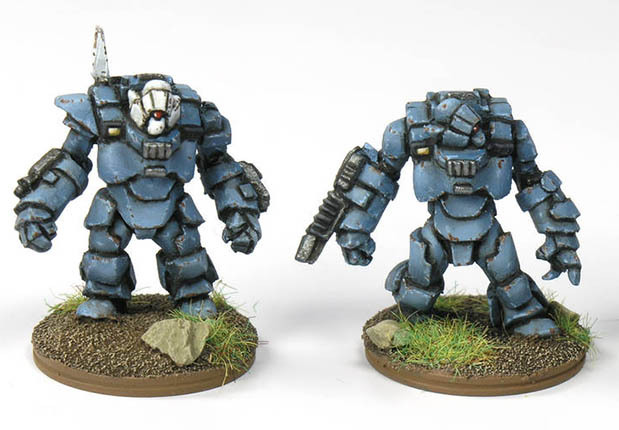 Therefore gamers who are handy with rare earth magnets may be able to swap backpacks so that each model can portray whatever type of suit is required during gameplay. 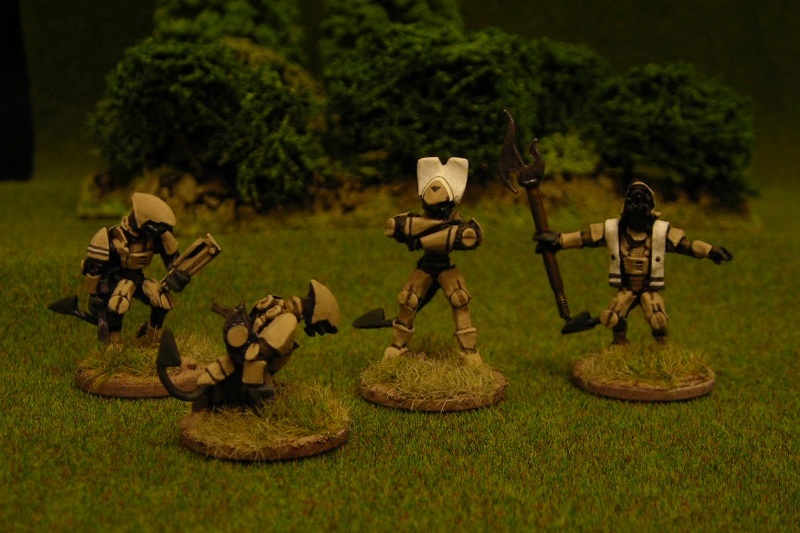 Human clone soldiers in carapace armour and strange helmets with five lenses, available in two ready-made squads with various weapons. 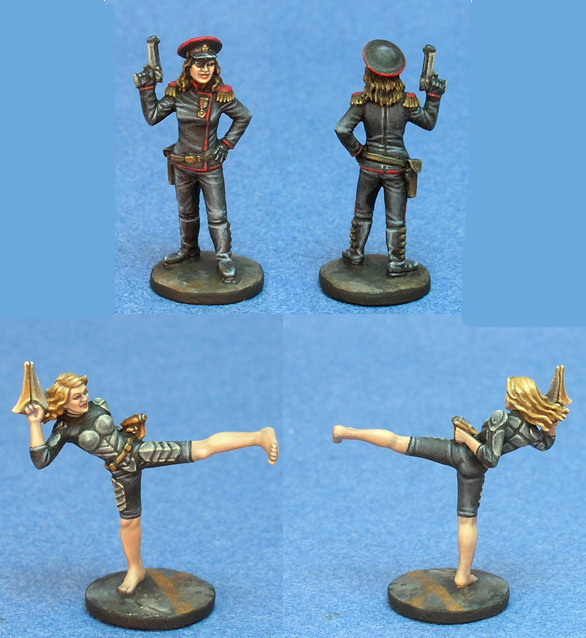 These are made up of roughly equal numbers of male and female poses. 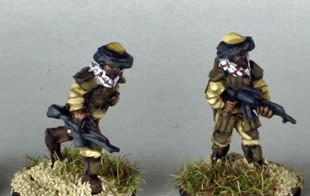 Desert planet military forces using the same equipment and uniforms as the Red Faction Infantry but with desert kit-out headgear including a cheaper "export" version of the helmet. 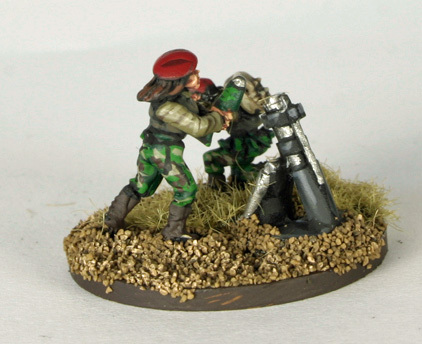 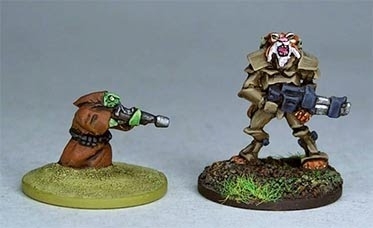 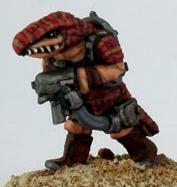 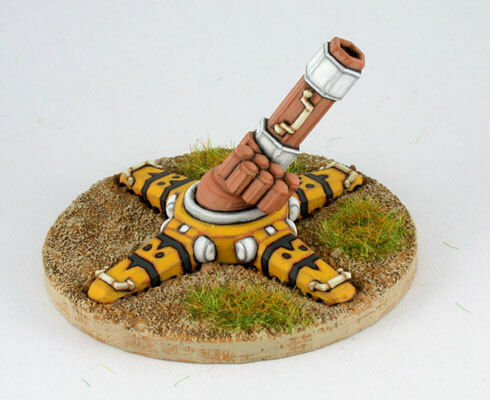 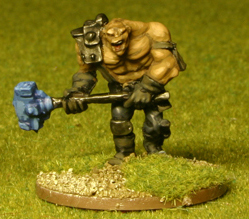 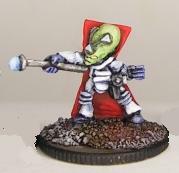 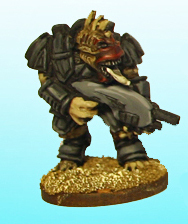 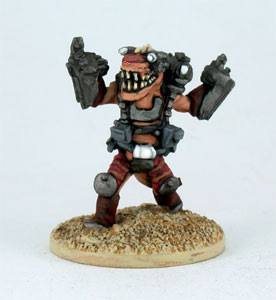 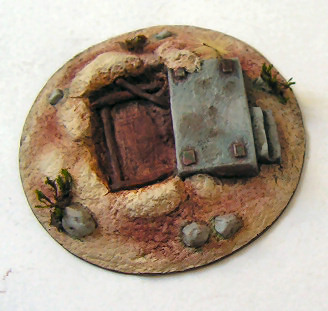 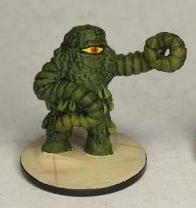 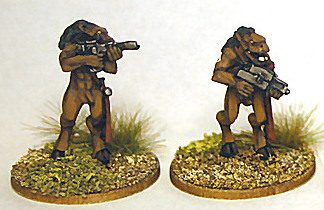 Models designed as hardbitten planetary defence forces but also work for "space 'Nam" type scenarios and bughunts. 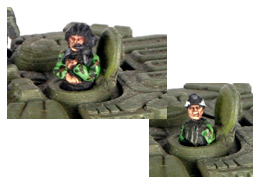 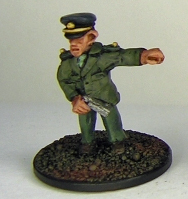 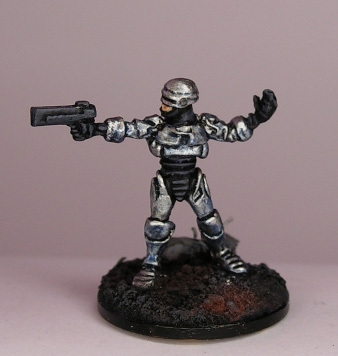 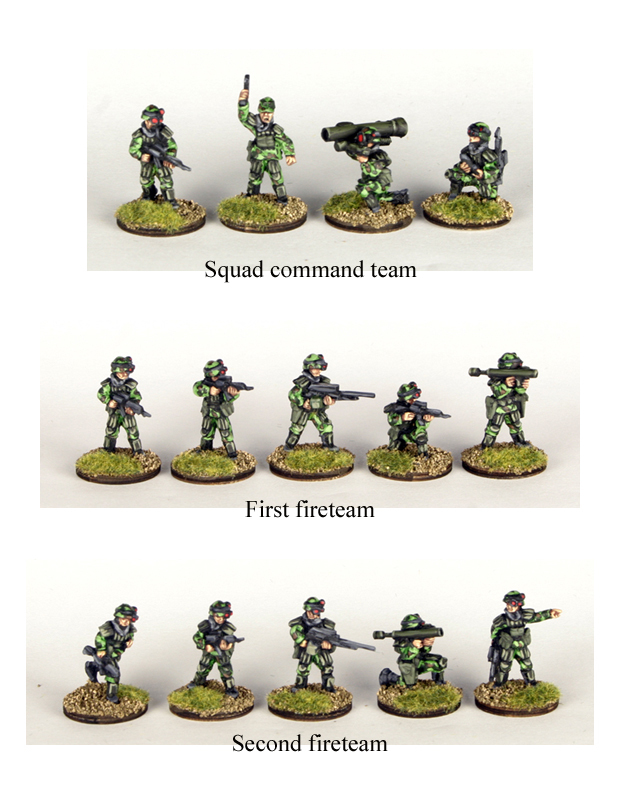 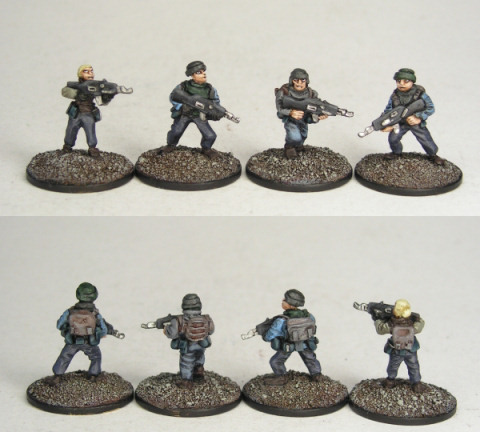 Image of defence forces in monotone painted by "Spacejacker." 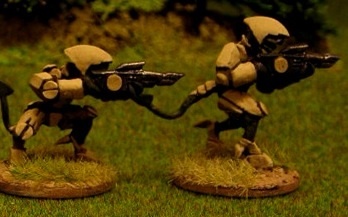 Models designed as NF or sci-fi humans in full, non-powered body armour ("carapace armour") with closed helmets, and appropriate high-end mid-tech weaponry. 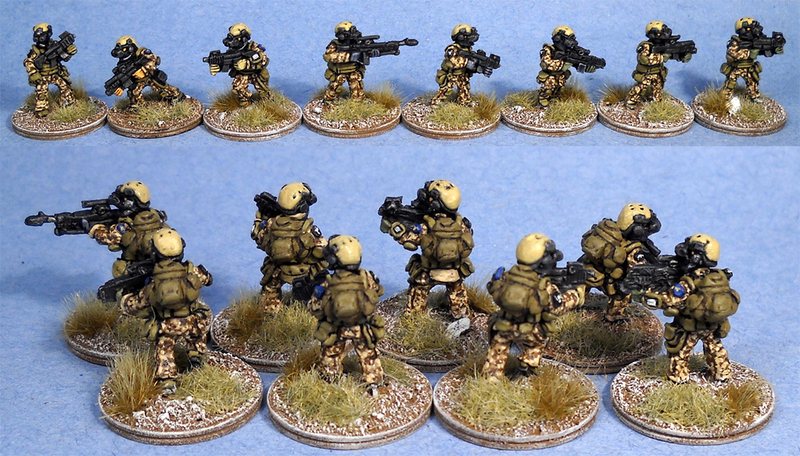 Red Faction Infantry with pulse rifles and helmet cameras/limited VR assist, wearing light armour. 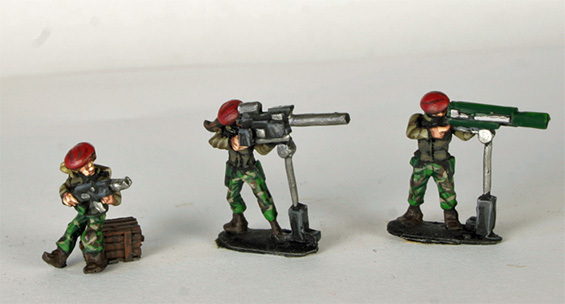 Various non-military types, some armed, some not. 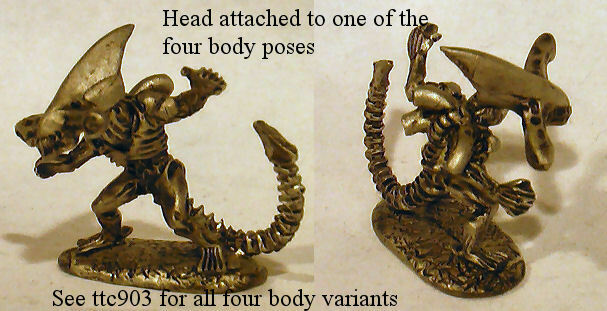 Some packs are aliens but are included here as they are frequently found in human civilisation or traveling on human ships. 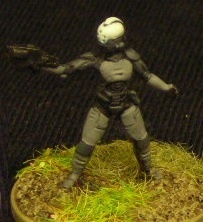 Models designed as NF or sci-fi humans in non-powered body armour with open helmets, and appropriate high-tech weaponry. 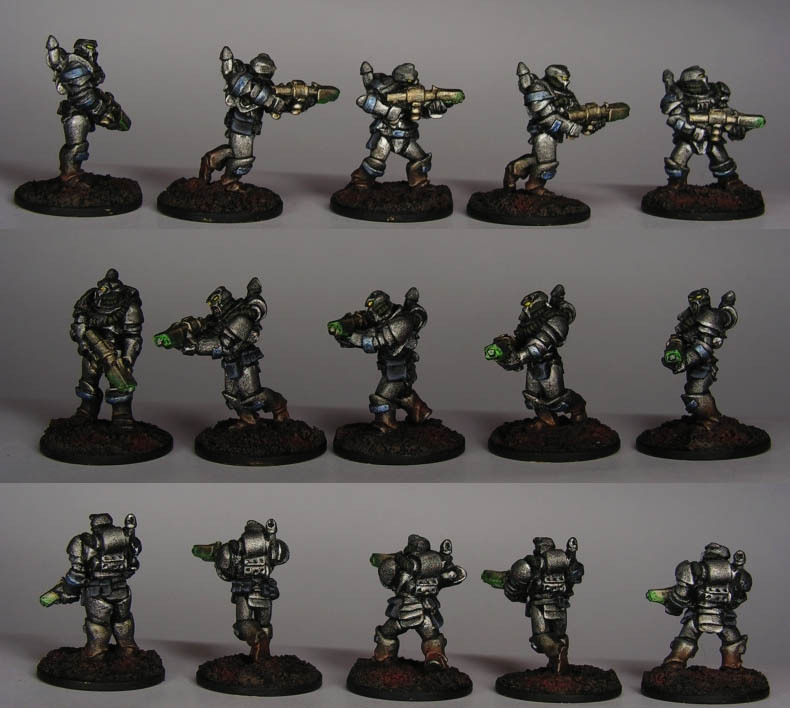 Models designed as sci-fi humans in heavy, powered body armour which is jet- and rocket-assisted, and appropriate high-tech weaponry (two types of large weapon, and a grenade rack on the back). 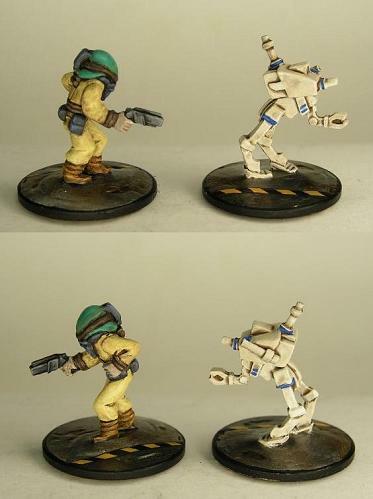 These models come with separate arms and weapons choices for maximum posability. 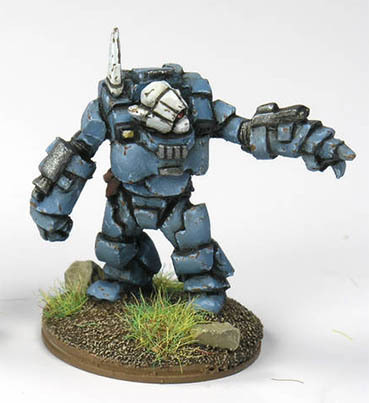 Less sophisticated but still very powerful power armour, it is not as mobile or advanced as the hi-tech power suit but still makes the wearer a formidable adversary, particularly the extra-heavy version shown here that is worn by elites and high command. 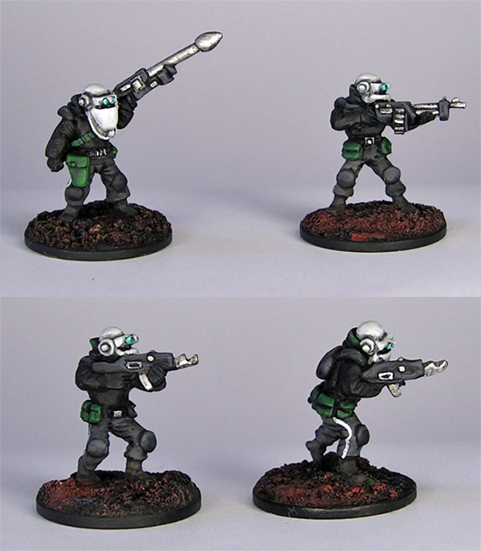 Models designed as NF or sci-fi humans in only light ballistic vests, carrying low-end mid-tech weaponry. 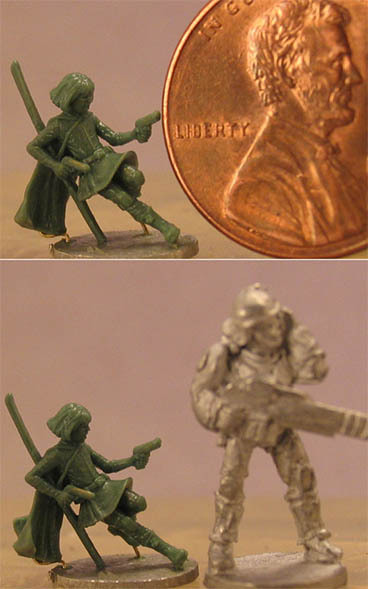 Perfect for armed colonists, militia, freedom fighters, insurgents, etc. 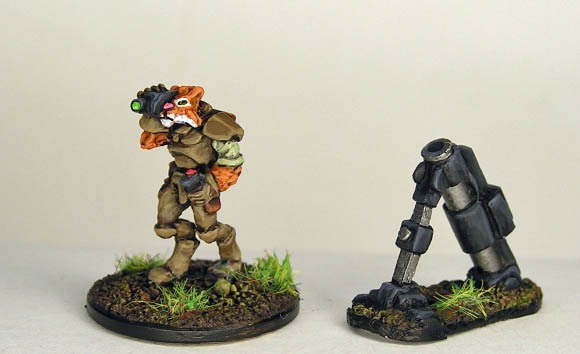 Character models for the tabletop. 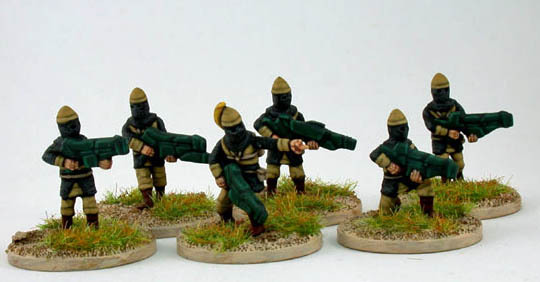 Sci Fi revival of the Persian Empire, with satrapal infantry wearing mesh armour evocative of ancient Sassanid chainmail. 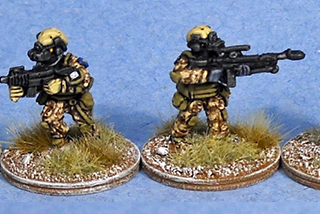 Listings include their infantry support weapons and light vehicles. 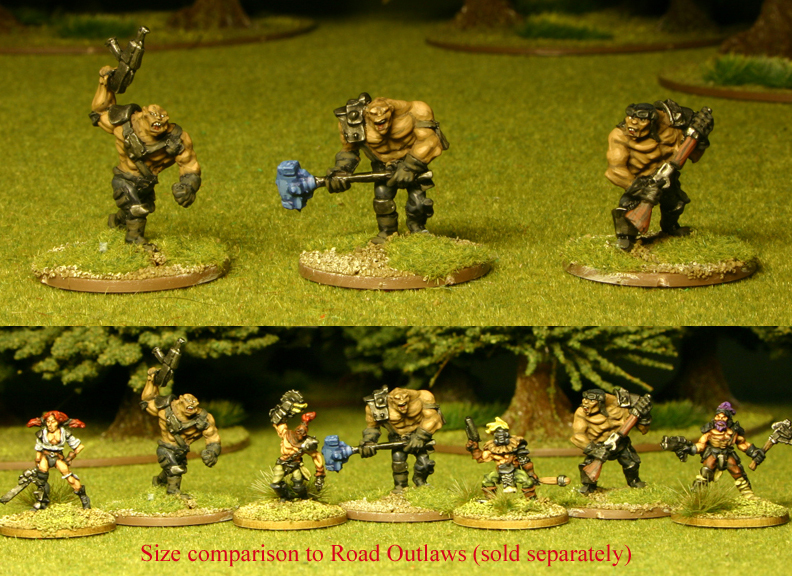 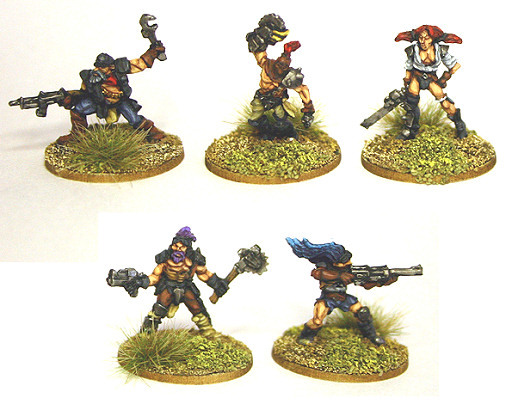 Marauding humans who serve as ravagers, pirates, urban planet underworld scum, etc., with mutant allies (or enemies). 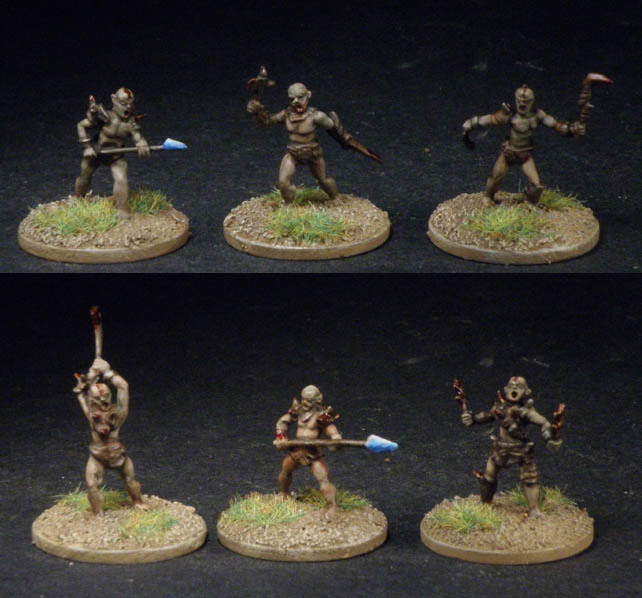 Hated and feared by both are the horrifying savage humanoid cannibals, with superhuman agility and energy. 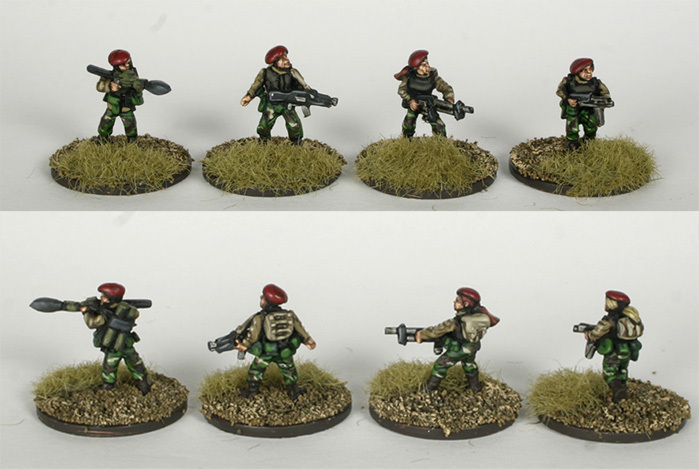 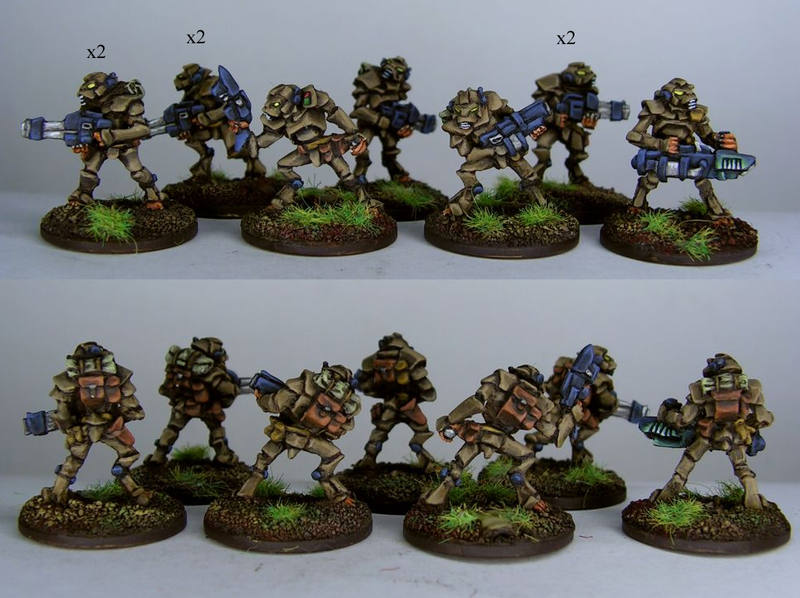 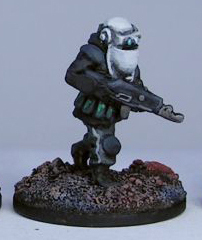 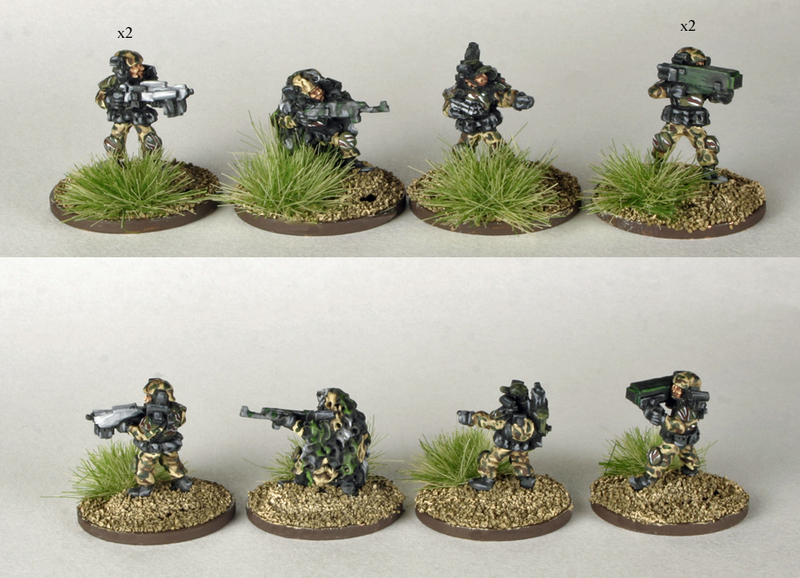 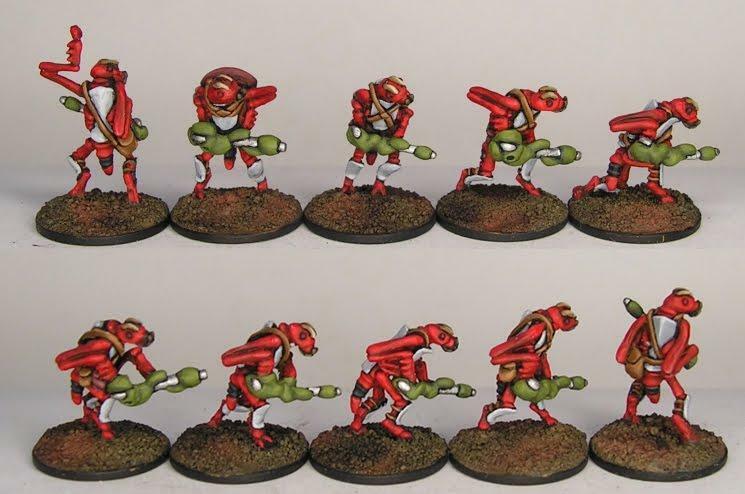 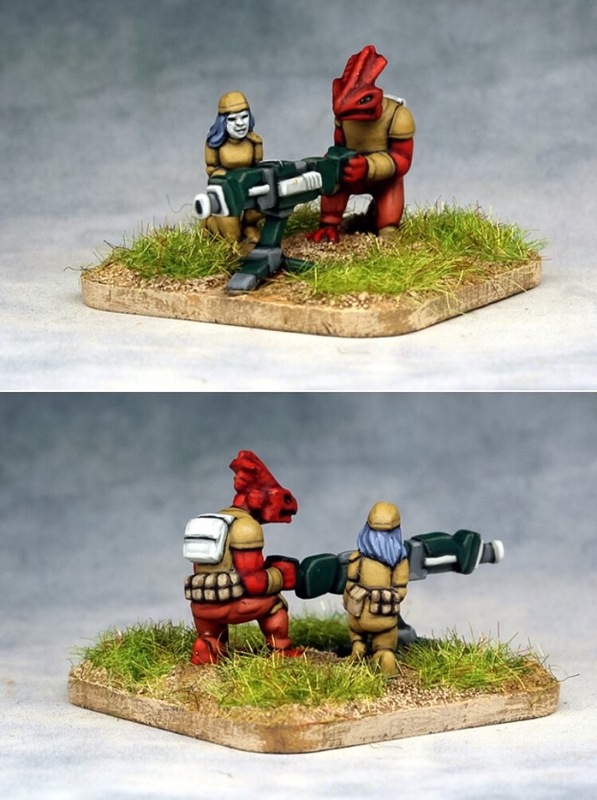 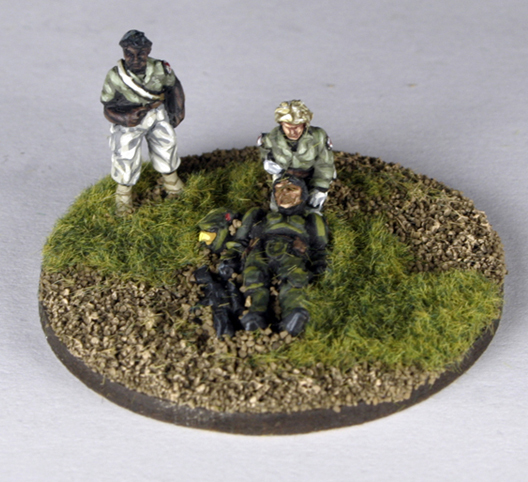 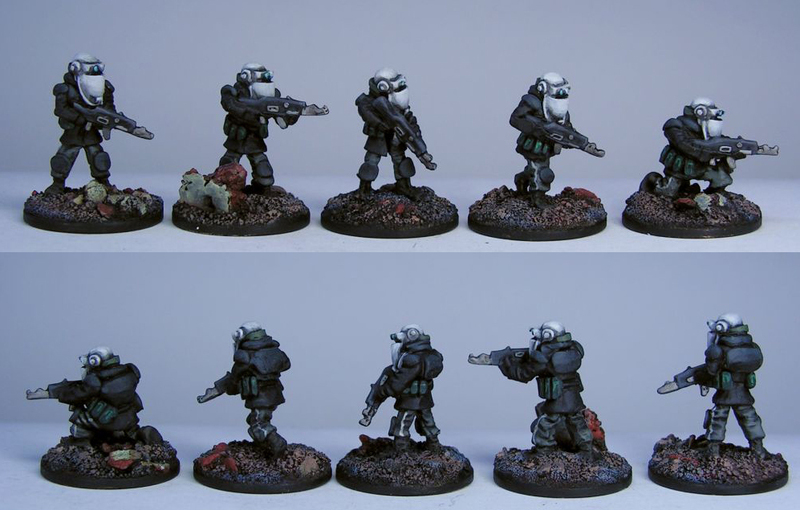 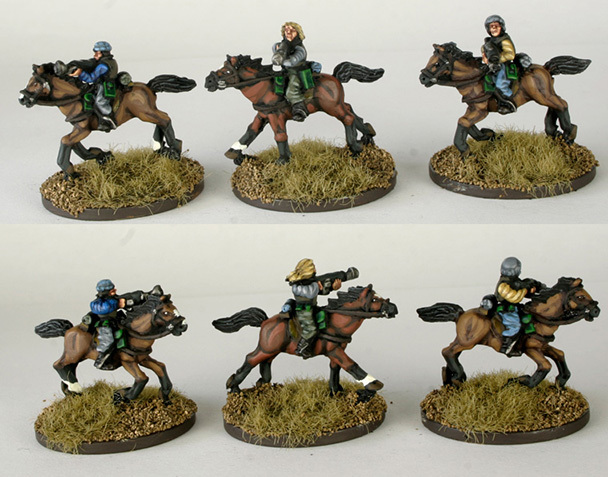 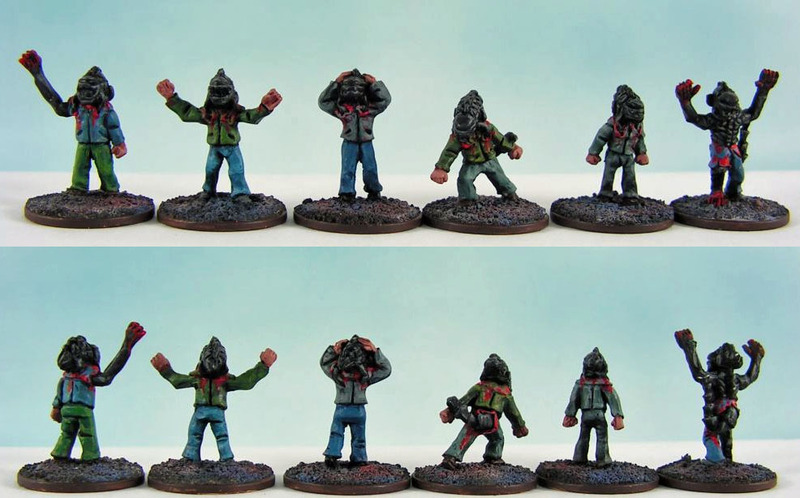 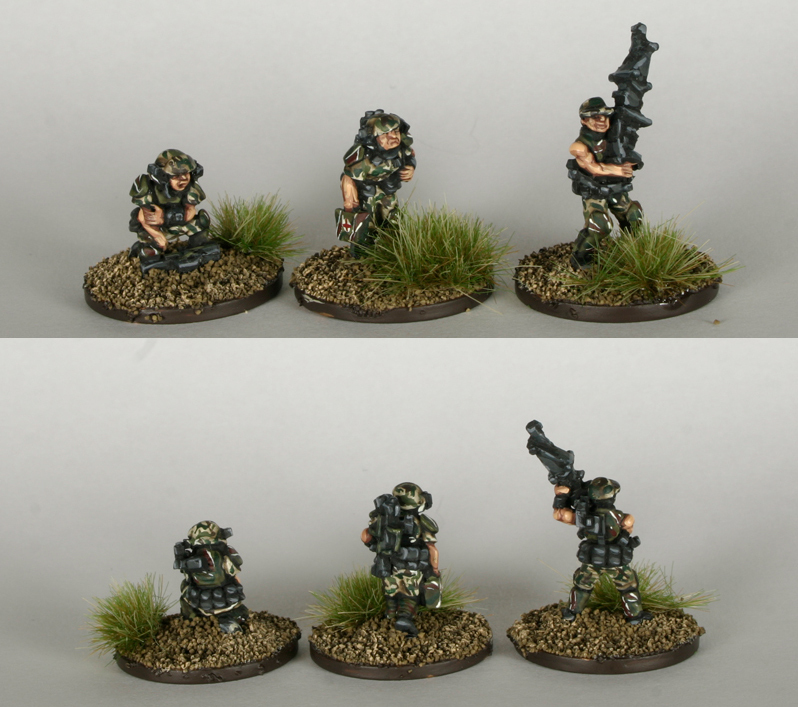 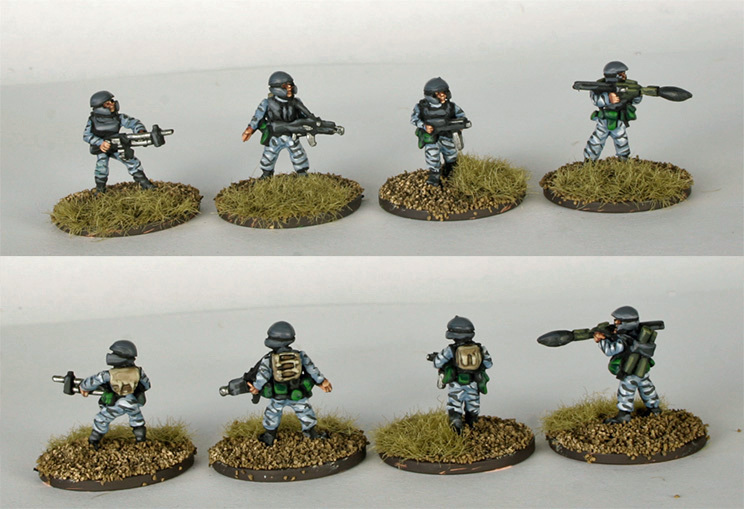 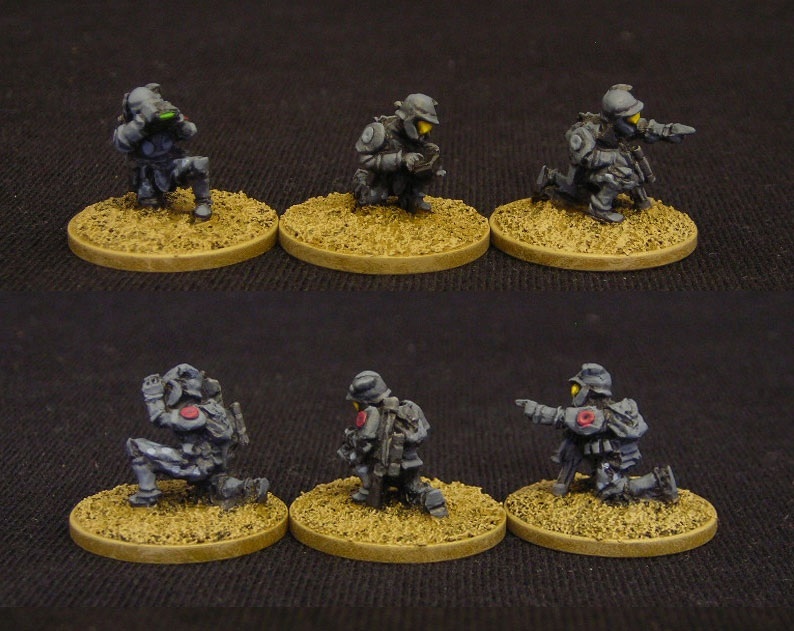 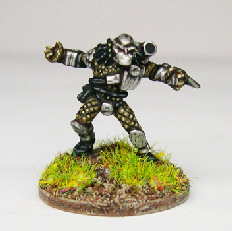 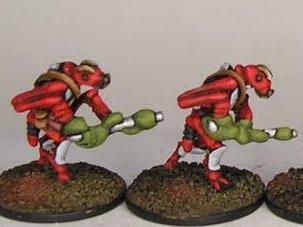 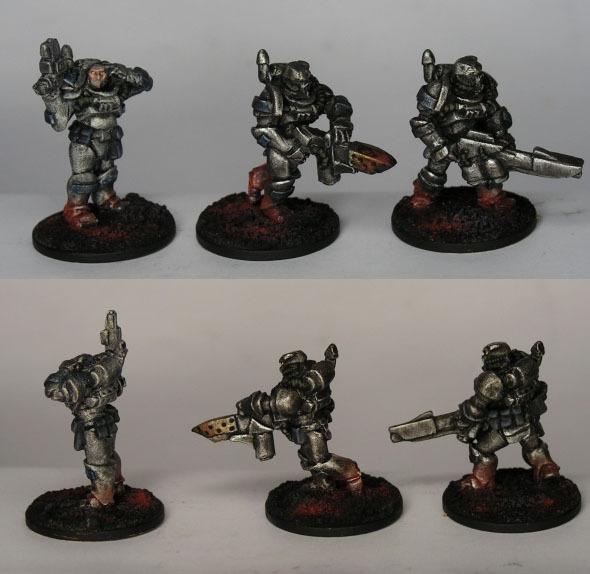 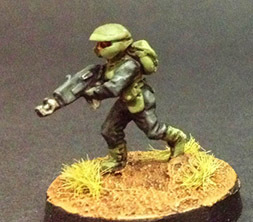 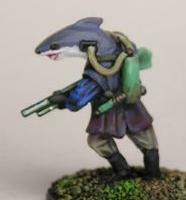 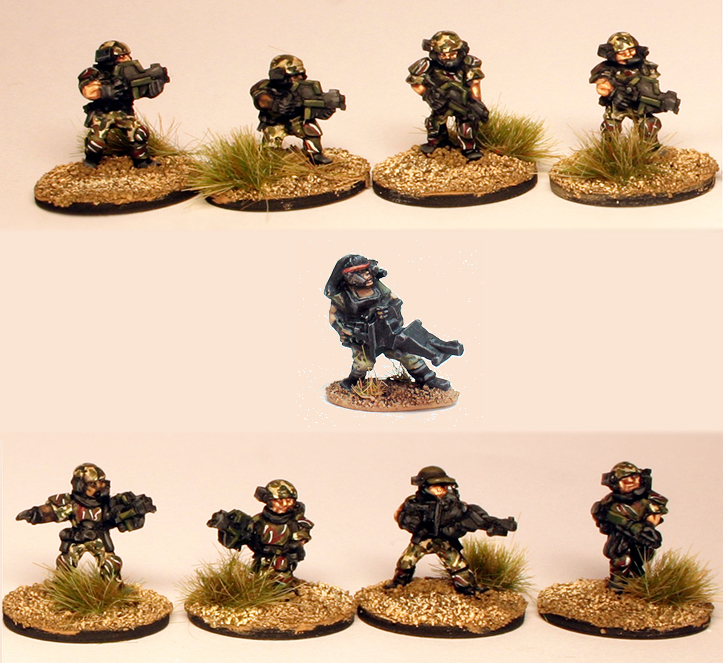 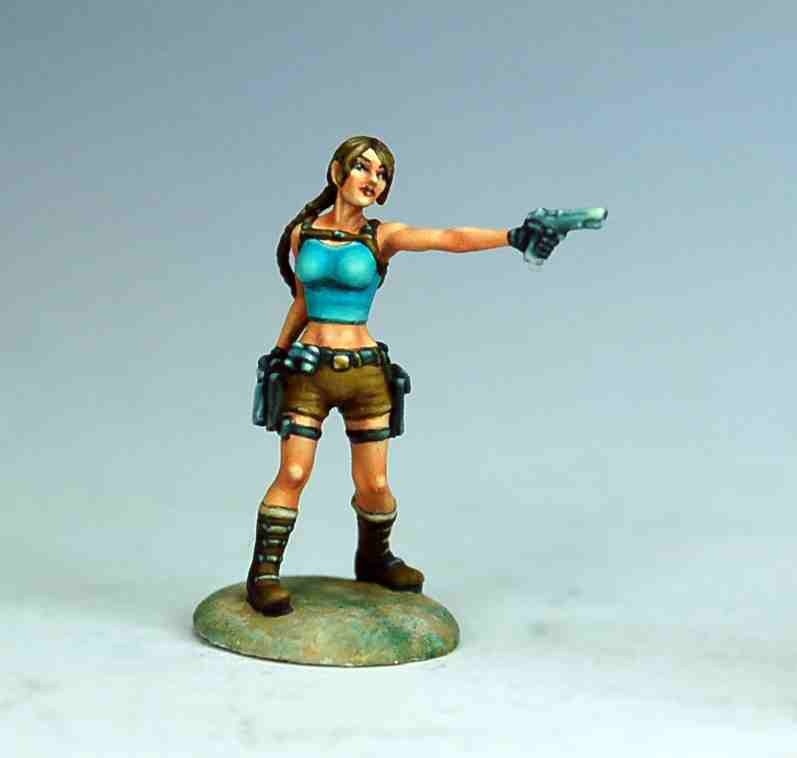 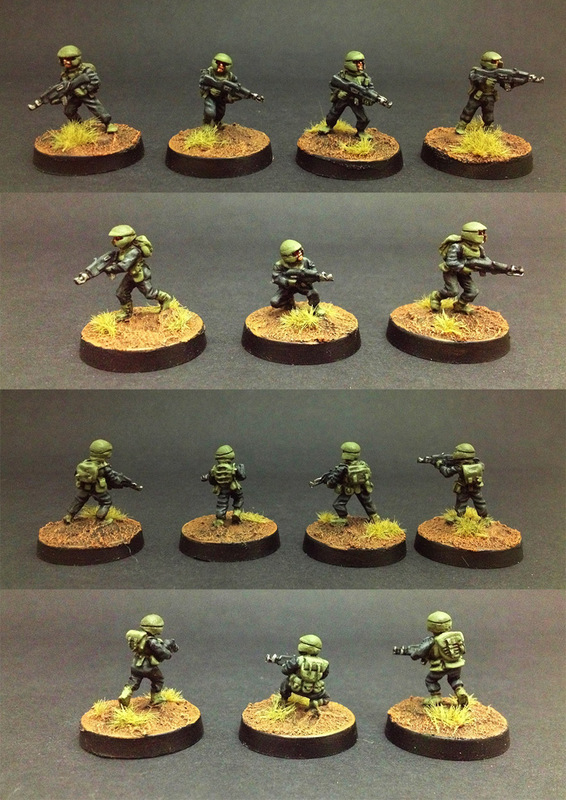 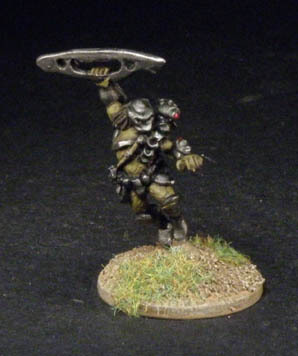 These are modern SEALs but have proven so popular as sci fi models that they are crosslisted here. 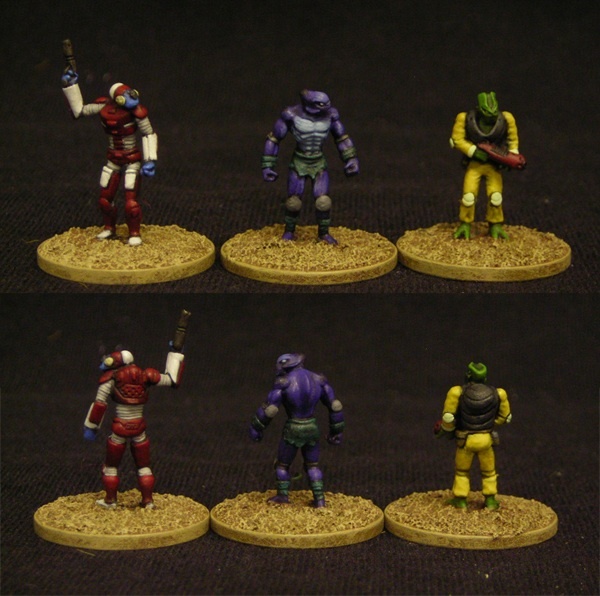 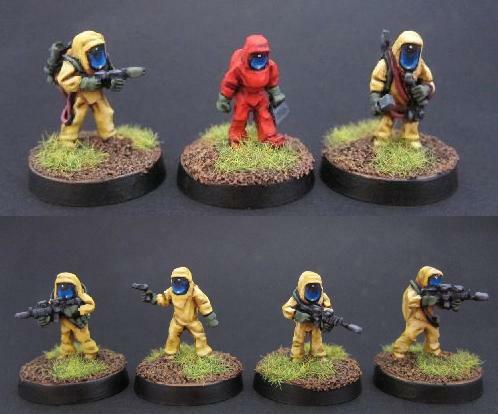 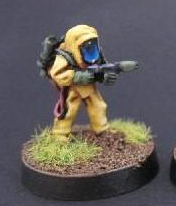 These are modern era troopers and scientists in Type A Hazmat outfits but have proven so popular as sci fi models that they are crosslisted here. 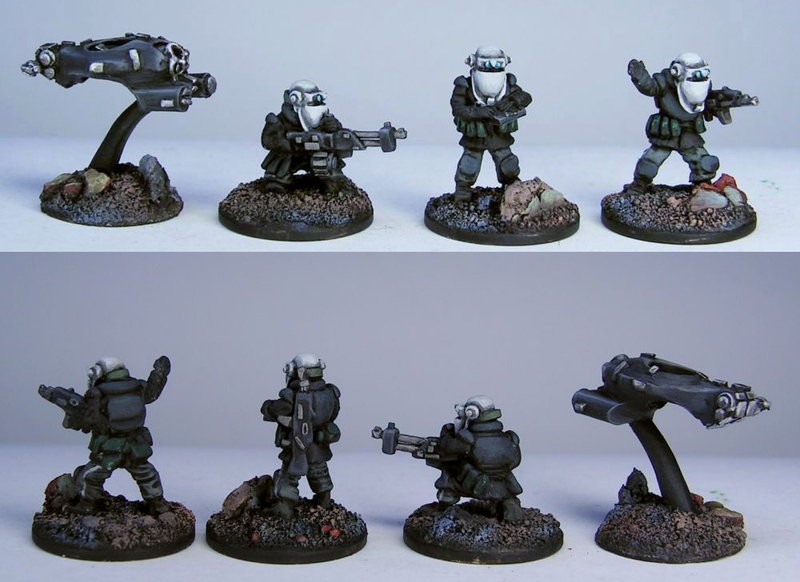 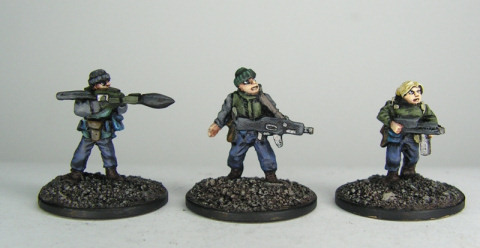 Lowtech military types with basic semi-auto rifles, and a variety of simple support weapons. 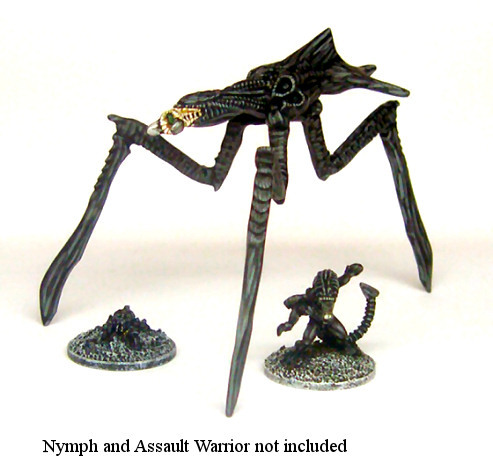 Very tall, powerful, and extremely militaristic aliens of advanced tech, governing an expansionist empire. 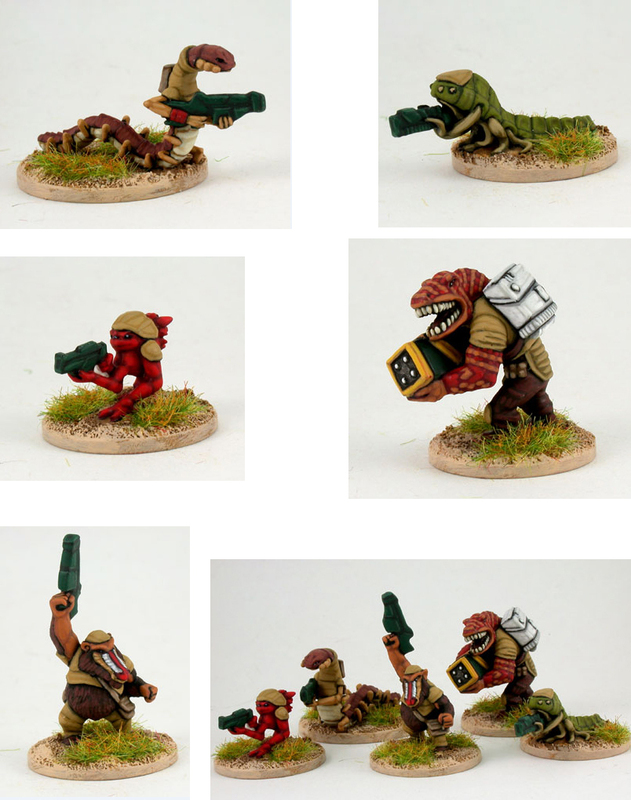 Like the French Foreign Legion, except made up entirely of aliens. 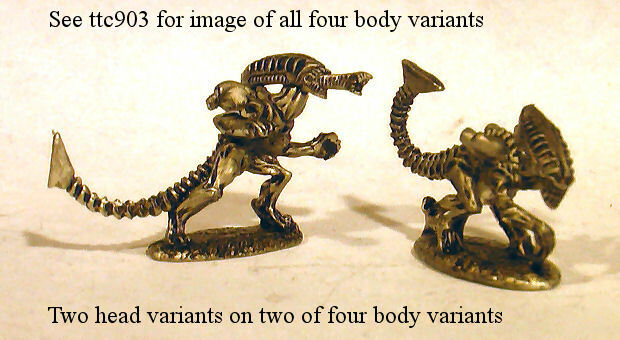 Each pose (and there are more than 20) is a unique alien species. 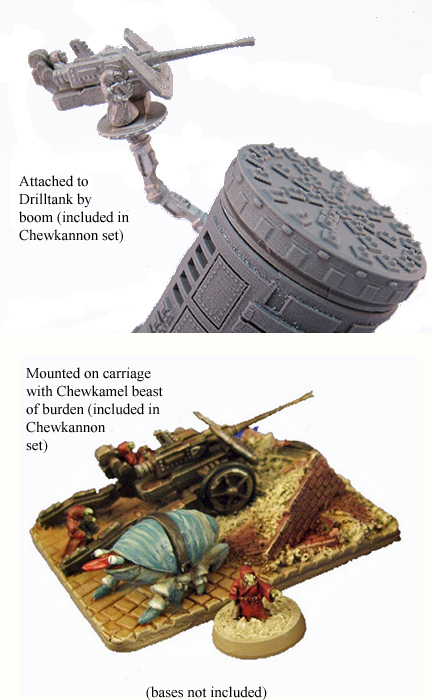 Their infantry support weapons and vehicles are included below. 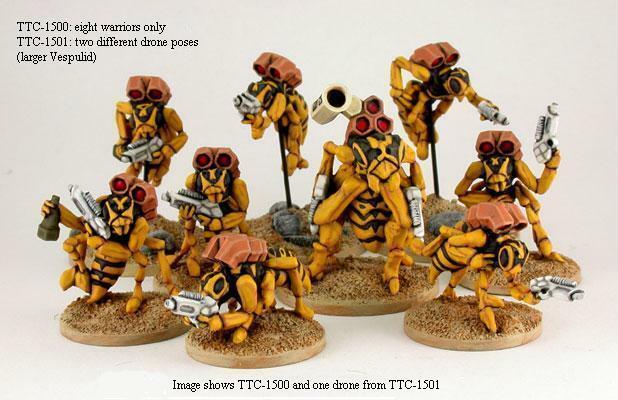 Intelligent, tech-savvy insectoid aliens with light armour. 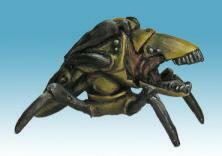 A larger and heavily-armoured sub-species is primed for close assault and boarding actions. 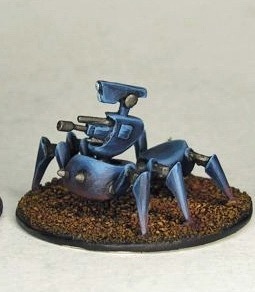 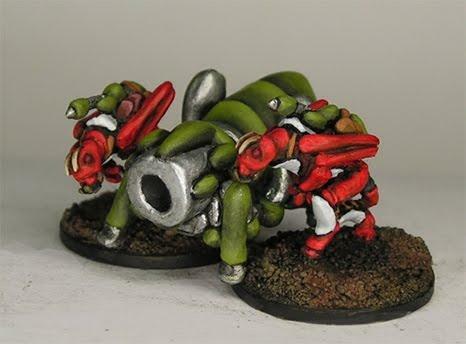 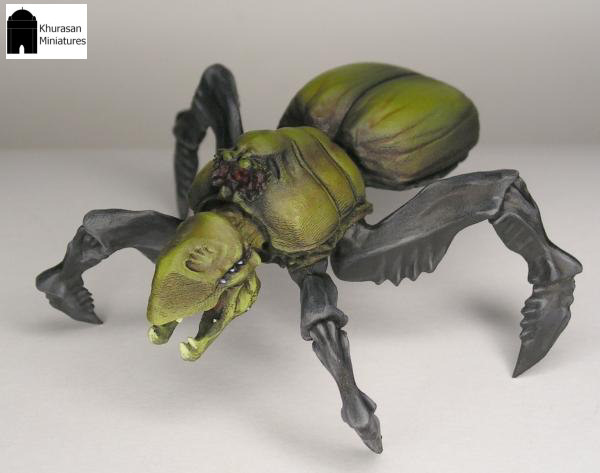 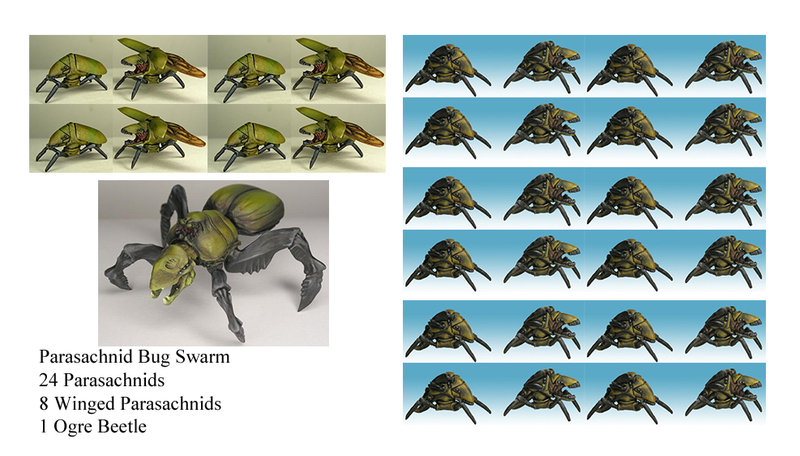 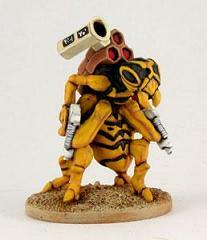 A biomechanical infantry cannon has legs and is guided into battle by two insectoid minders. 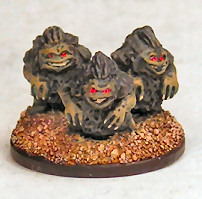 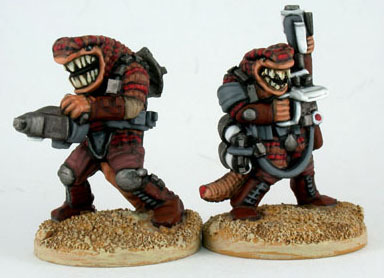 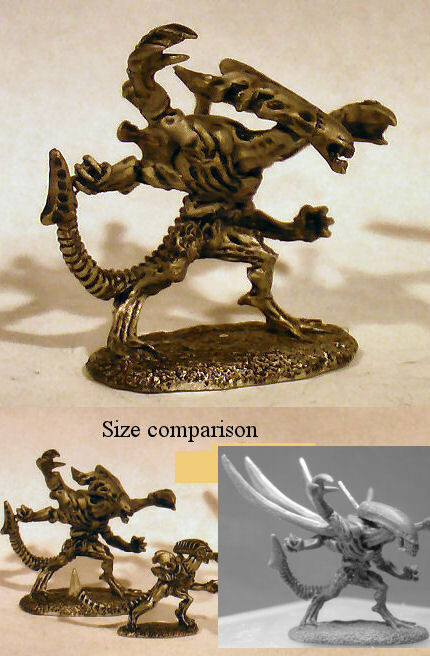 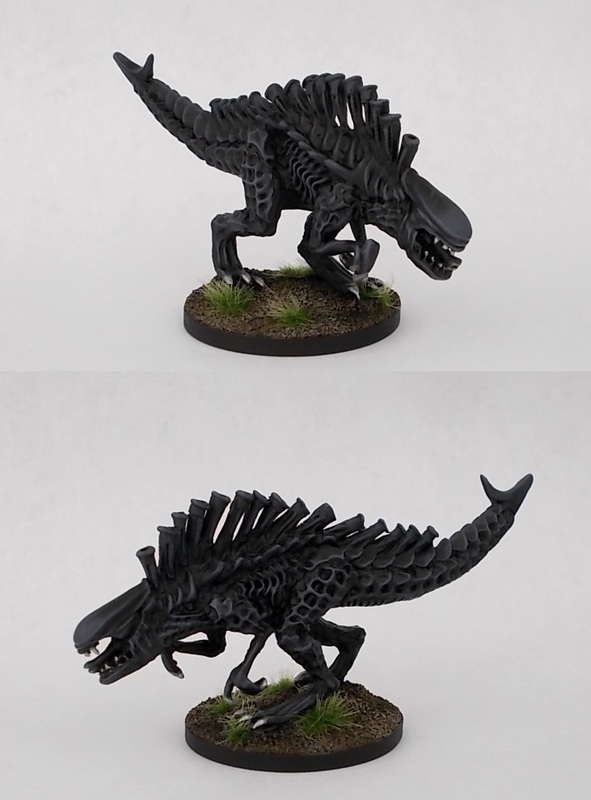 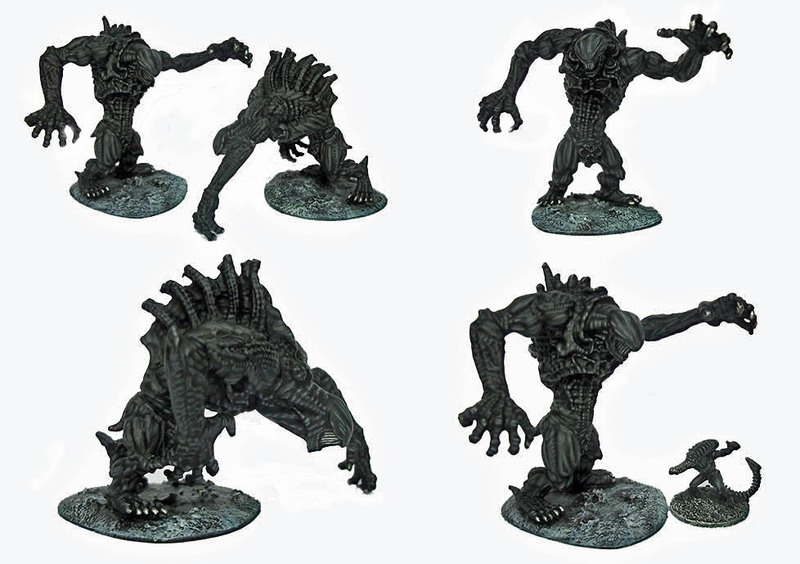 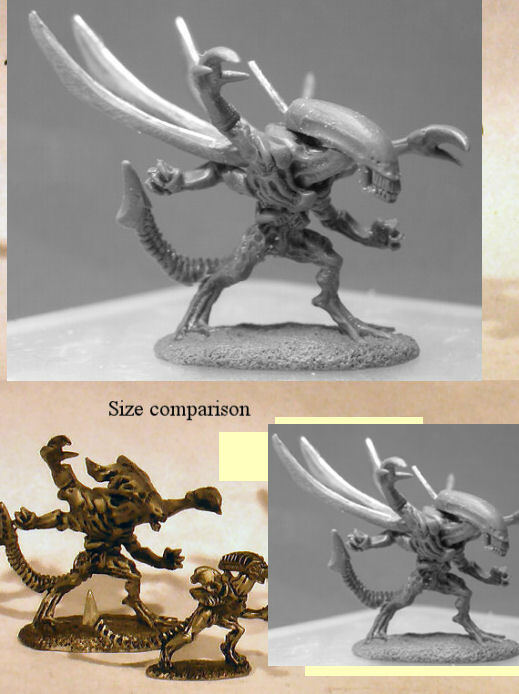 Enormous (roughly 25mm tall) and horrifying demonic aliens carrying assault rifles larger than human heavy machine guns. 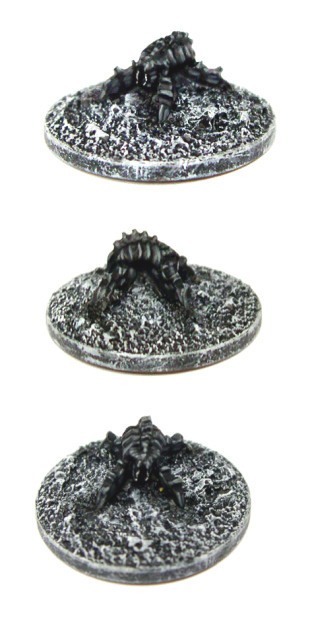 Very heavy bulk to suggest in-scale largeness for 15mm gaming. 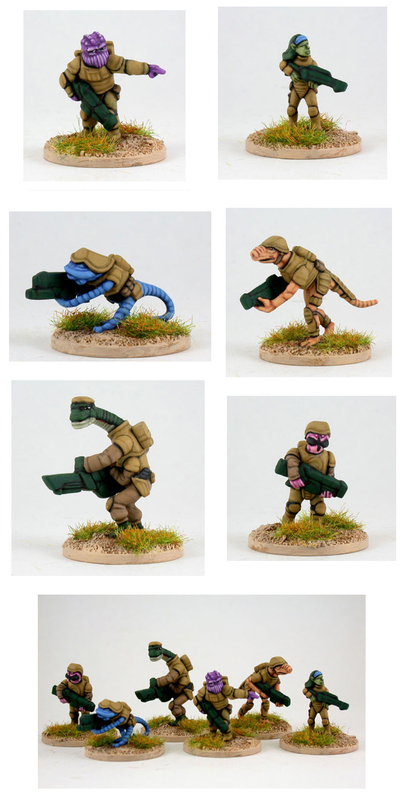 Hulking carnivorous Reptilian Aliens with sophisticated technology, including force field projectors on their backs replacing bulky body armour. 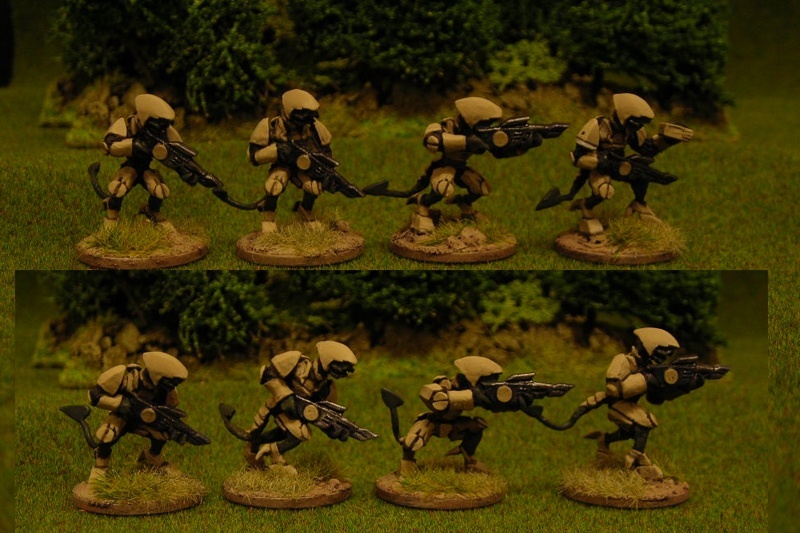 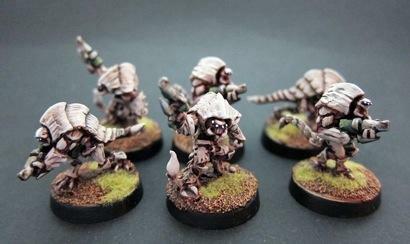 Felid aliens with body armour and high-end mid-tech weapons. 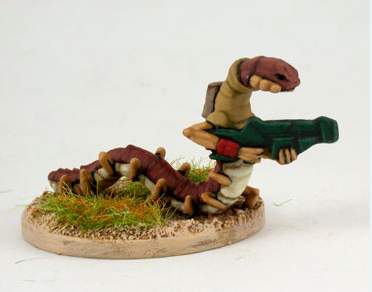 Tiny but still formidable Bedouin shrimp, armed with a variety of weapons. 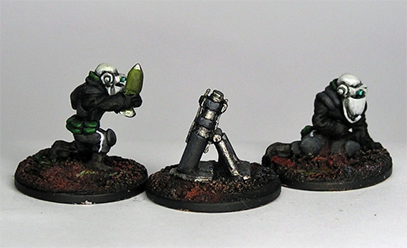 Irate, heavily armed space vegetables, rather taller than humans. 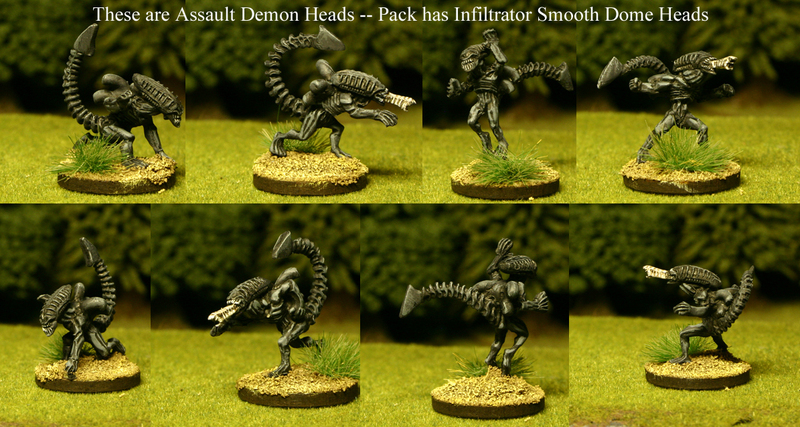 Each pack comes with separate mouthpieces with opened and closed mouths, which are easily attached to the bodies. 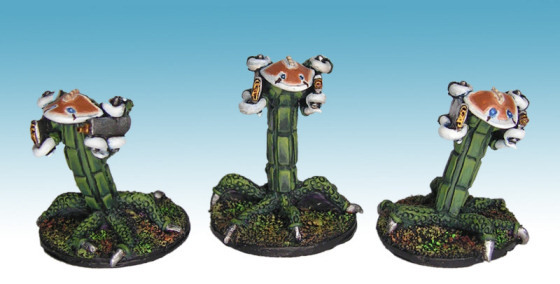 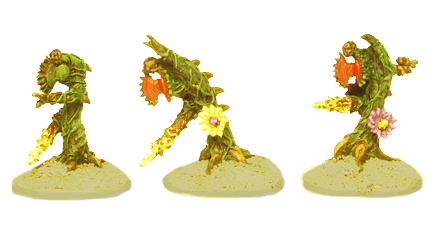 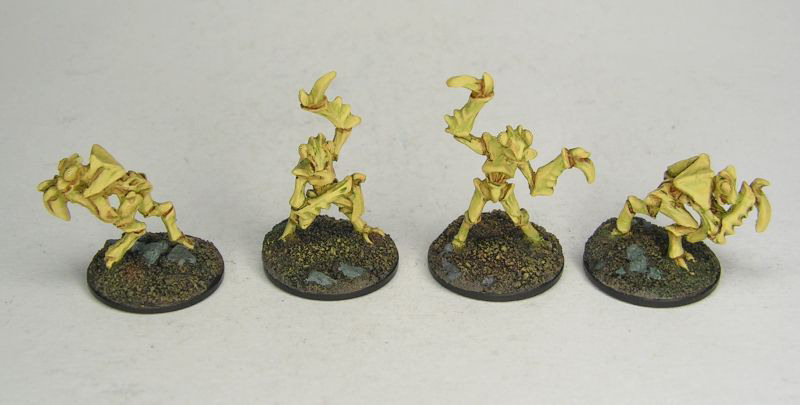 The packs also come with accessory sprues that can be attached to the bodies of the Botanoids, such as flowers or leaves, to give the models some more individuality, or may be left off at the gamer's preference. 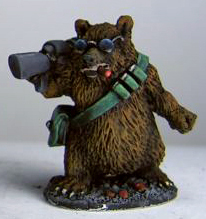 Seven foot tall, cigar smoking Ursoids with BPFGs (bear-portable fusion guns). 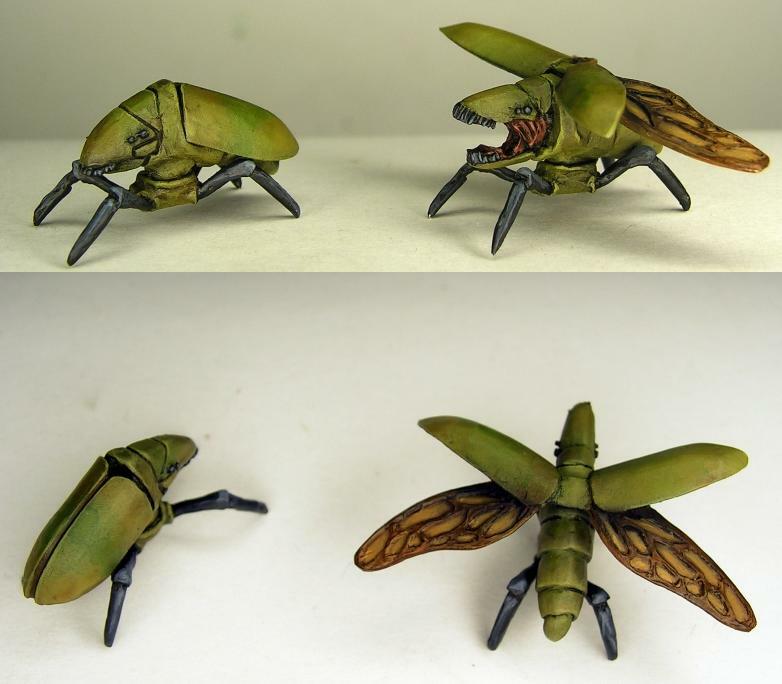 Wasp-like aliens with their wings replaced by jetpacks for quick attacks, carrying alien blasters. 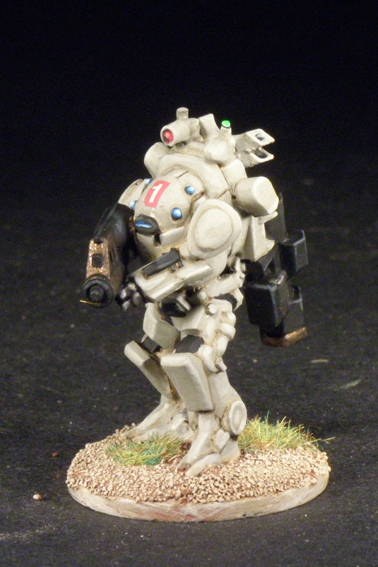 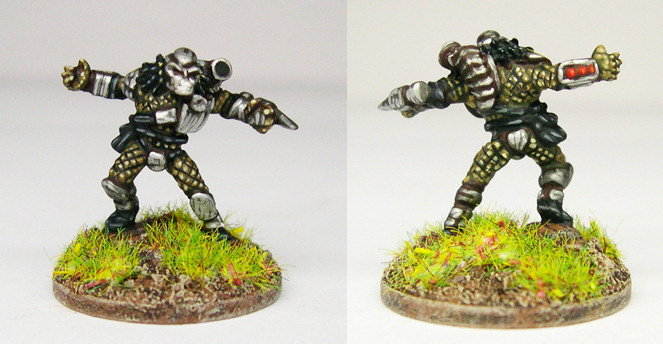 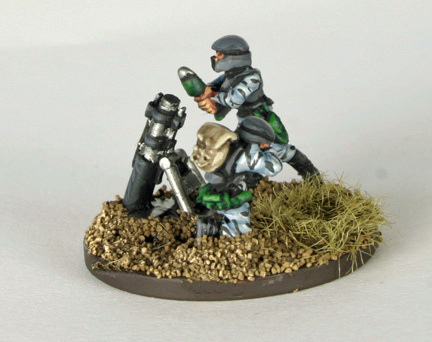 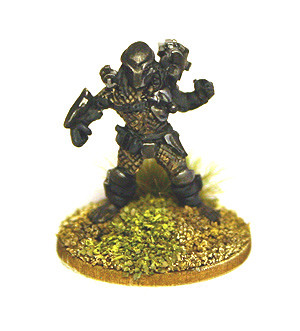 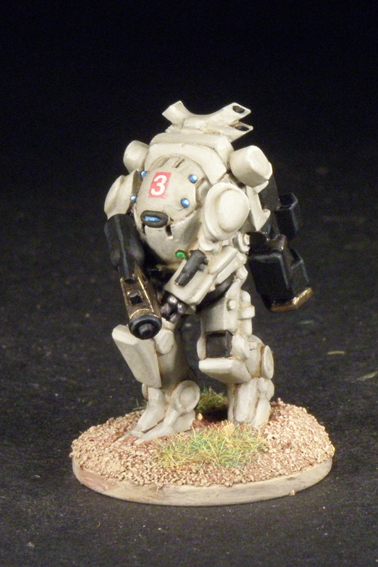 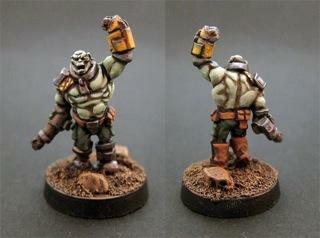 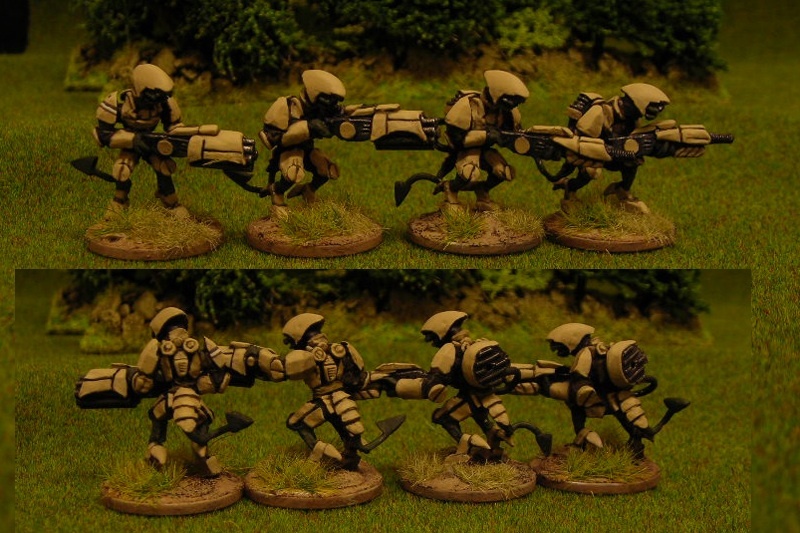 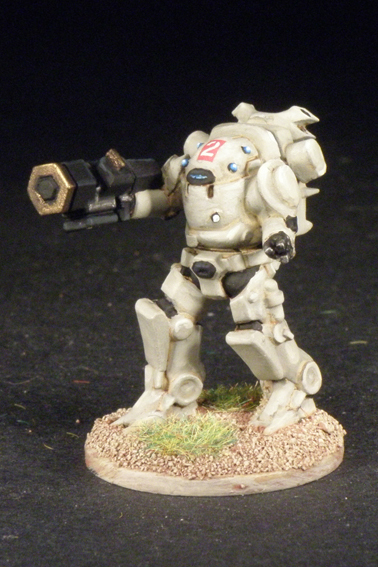 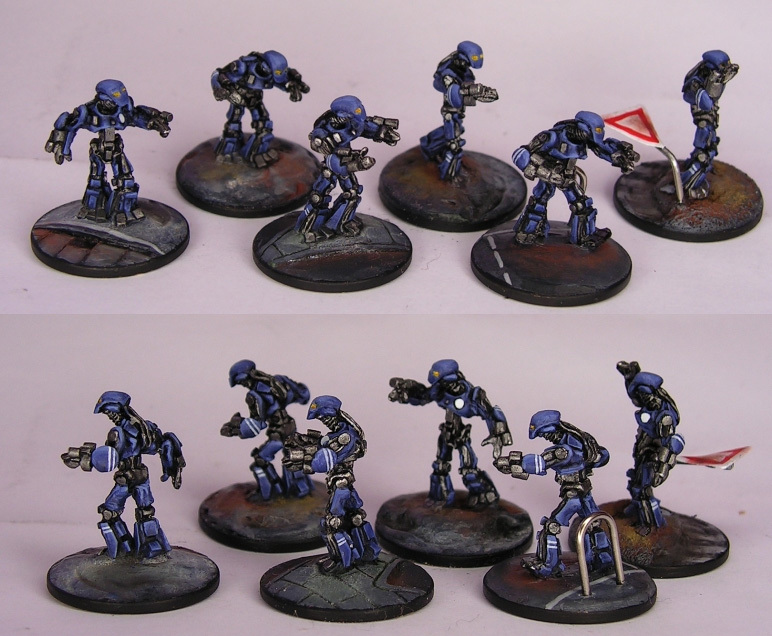 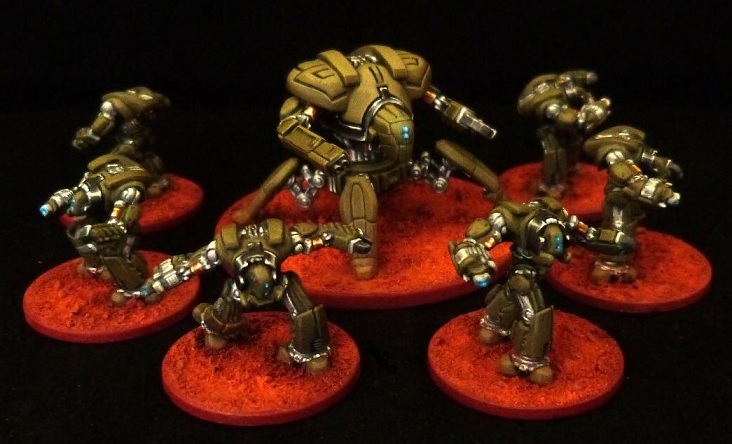 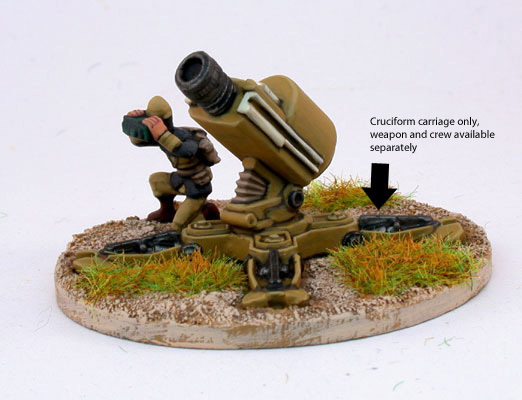 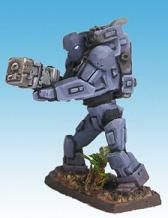 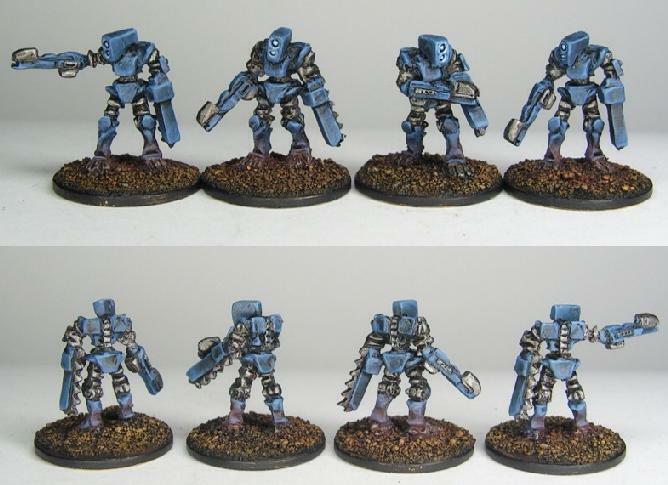 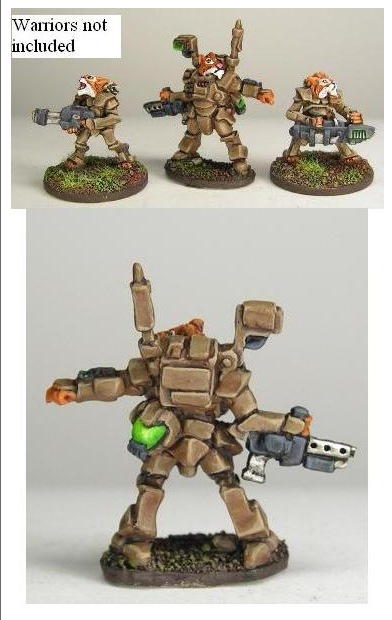 These are commanded by a huge alpha warrior with a light mortar mounted on its jetpack. 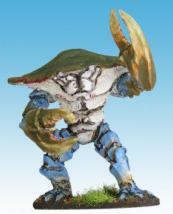 Aliens from an aquatic civilization, with various types of tech, fighting in an alien environment -- ours! 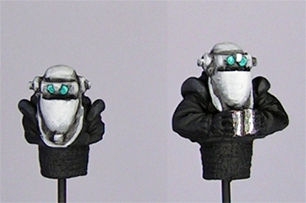 Accordingly some wear reverse scuba gear (with water in it) and some wear power armour. 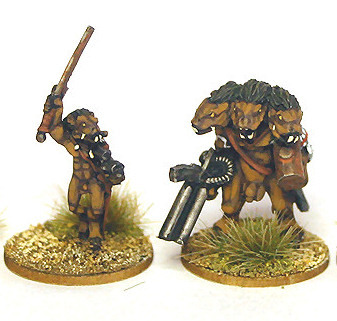 Hard-to-categorize, hooved and otherwise vaguely mammalian savage tribesmen who have obtained crude blasters and carry large swords. 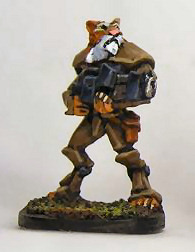 Very tall and lanky. 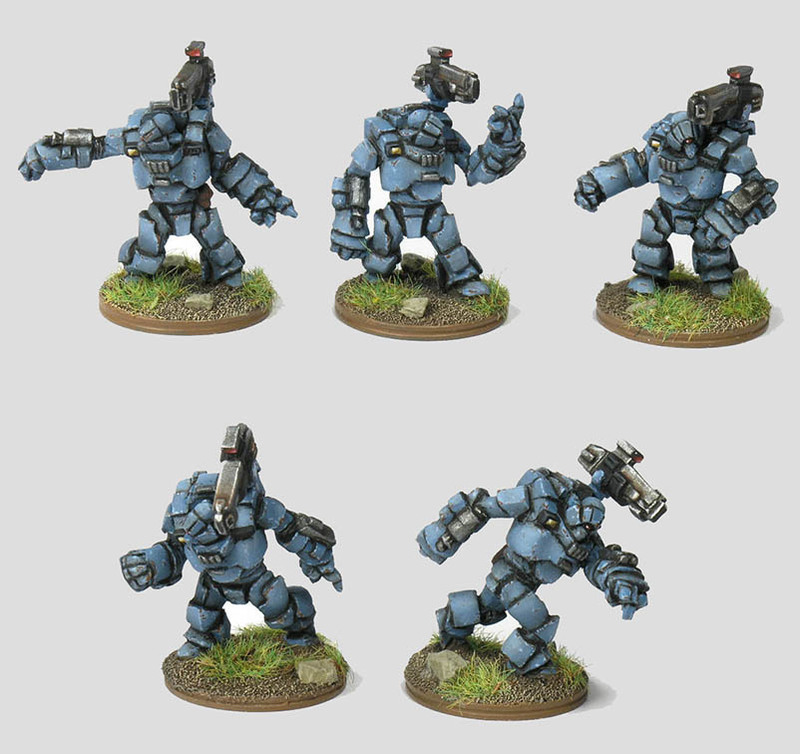 Combat robots of various types. 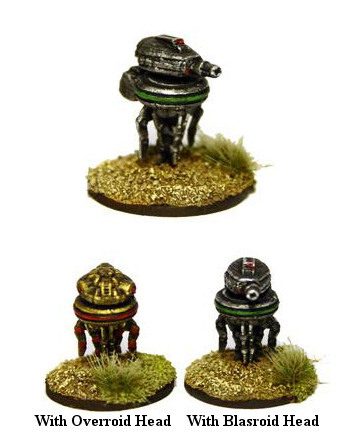 Retro invaders with death rays. 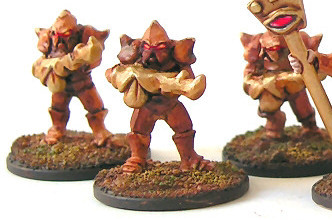 No, the triangles on their foreheads are not their eyes, they are groovy head jewelry. 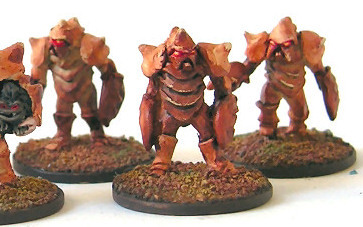 Hardshelled warriors with biological weapons, or big claws. 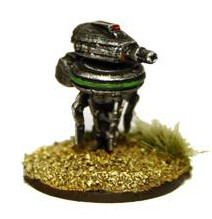 Hover Robots with bad intentions. 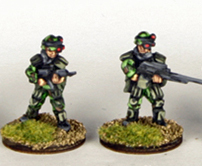 Four bodies, four gunturret heads, one commander multi-lensed head. 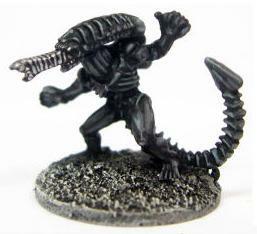 Big, mysterious, very powerful aliens who kill for sport. 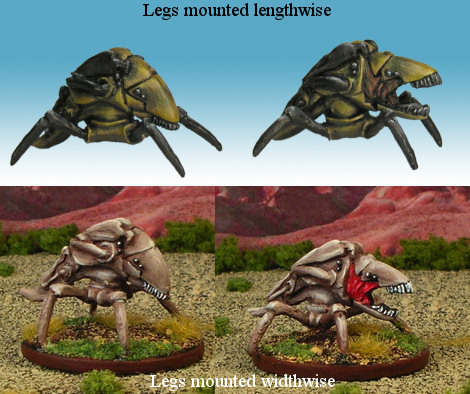 Hideous, smarter than "creatures" should be, maneuvering with military precision, frighteningly deadly in close combat, stealthy stalkers. 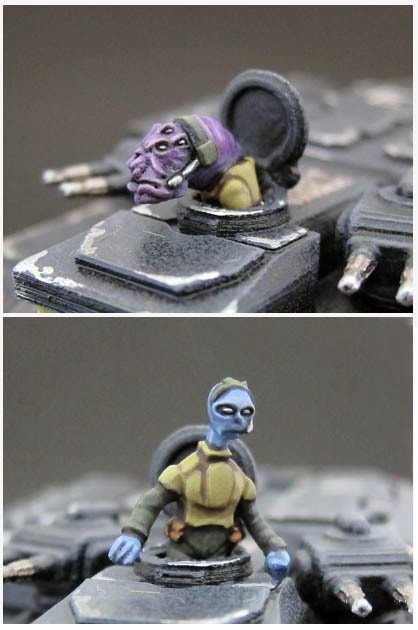 Fast, large, strong, fearless, unthinking. 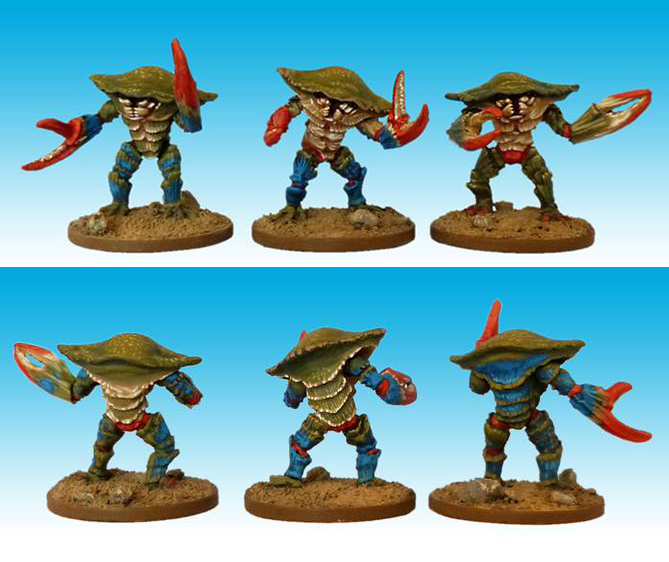 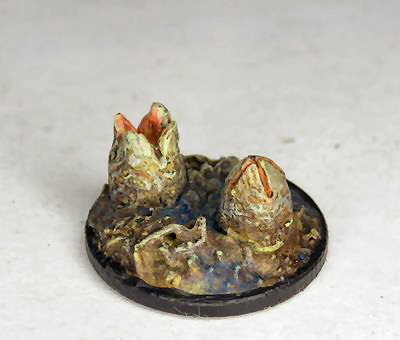 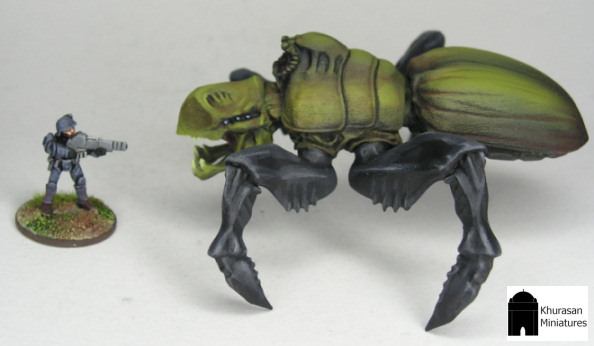 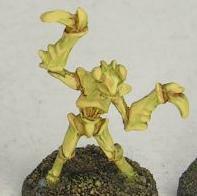 Very large (almost 25mm) crab creatures, in three poses. 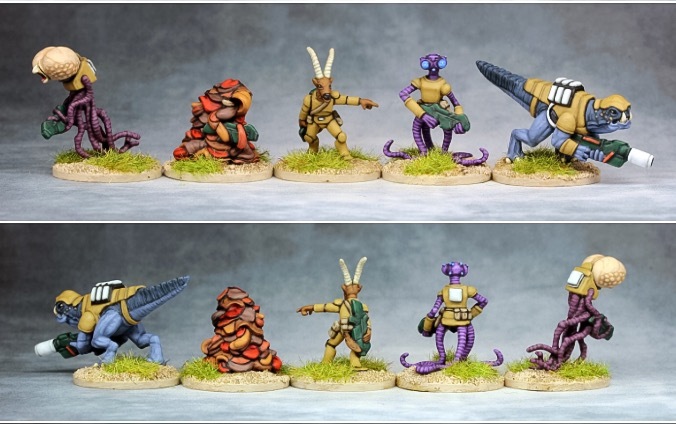 Four different poses of man-sized alien preying-mantis creatures. 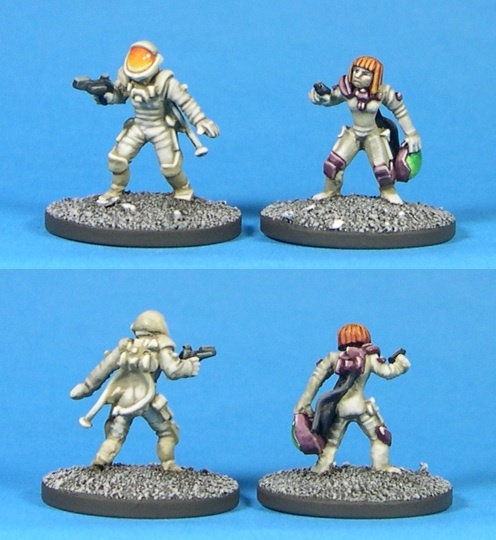 Three poses of retro monocular, tentacled space monsters. Three poses of tiny demonic creatures with fur. 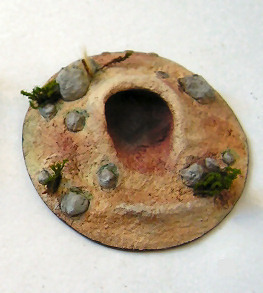 Things for the tabletop for the aliens to hatch from, or spring out of.